Judy Parkinson is a writer, TV producer and artist. She has written best selling books about mnemonics and history; I Before E, Except After C and Remember, Remember the 5th November respectively, among others. Judy has produced music videos, commercials and TV documentaries for all the major broadcasters, on subjects ranging from art history, travel, nudism to dentistry. She has exhibited her artwork on several occasions and she is currently developing a research project about how art can help people living with dementia. 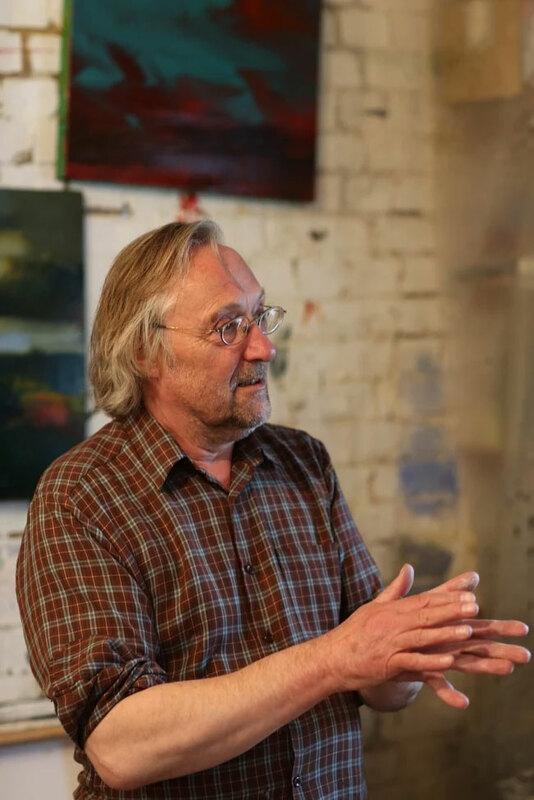 Alan Rankle is recognised as a significant and influential artist whose work explores social and environmental issues through his continuing interest in landscape art. Since his first exhibition at the Institute of Contemporary Arts in 1973 while still a student at Goldsmiths’ College, he has worked in painting, video, photography and architectural intervention in a series of international exhibitions and commissions. Major retrospective surveys of his work have been presented at Gallery Oldham in Manchester in 2006 and Fondazione Stelline, Milan in 2010. He is represented in London by The Cob Gallery. If you go down to the woods today, you might be in for something of a surprise, with dark disturbances insinuating their way through Arcadia’s rolling hills and fertile valleys. At first sight nature stretches out, bucolic, unchanging, idyllic, poetic, but look again at Alan Rankle’s work in his show, Pastoral Collateral, and his urgent messages soon become clear as he brings the past crashing through the now and into the future. Our natural surroundings become secondary, subordinate, collateral. 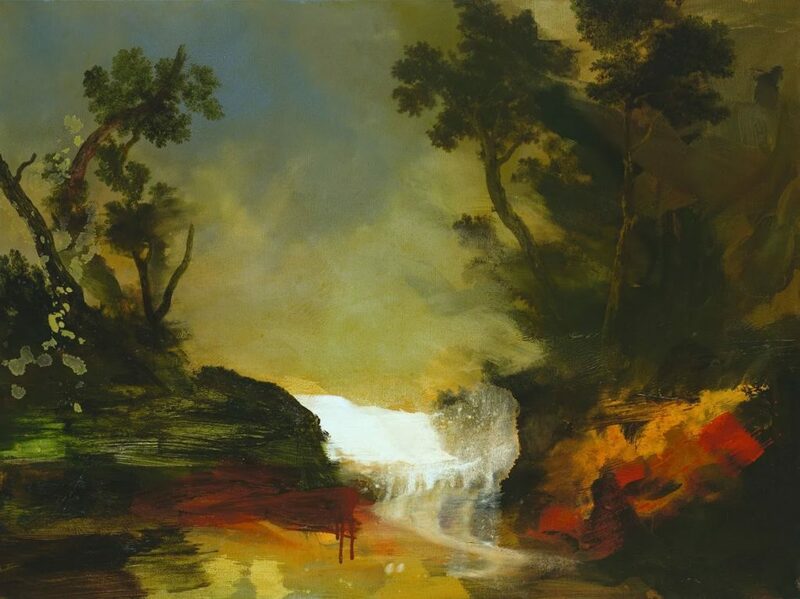 Rankle continues his preoccupation with revitalizing the tradition of landscape art within the context of our post-industrial, and arguably pre-apocalyptic, world. In Rankle’s recent work, he seems to treat the whole history of landscape painting as a “found object.” He fuses aspects of Classical and Romantic painting with Abstract Expressionistic gestures; he paints trompe l’oeil elements as though from a 19th Century naturalist’s journal. He knowingly references conceptual asides to provide an undercurrent of contemporary unease. 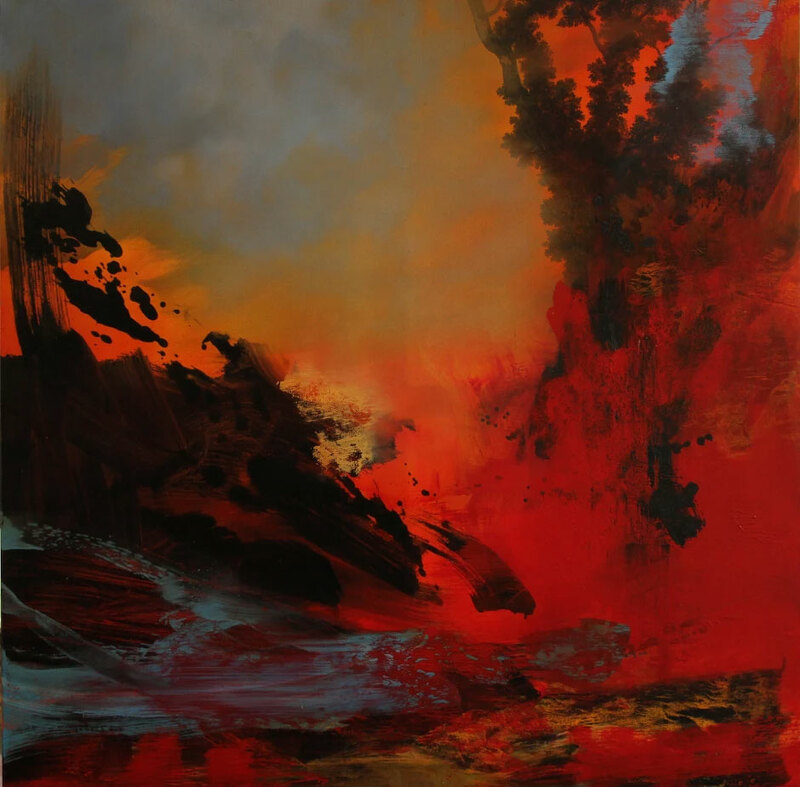 All these elements collide as portentous montages in the paintings, depicting a world splintering and fragmenting towards chaos, yet still evoking an eerie, and somehow threatening, illusion of harmony. 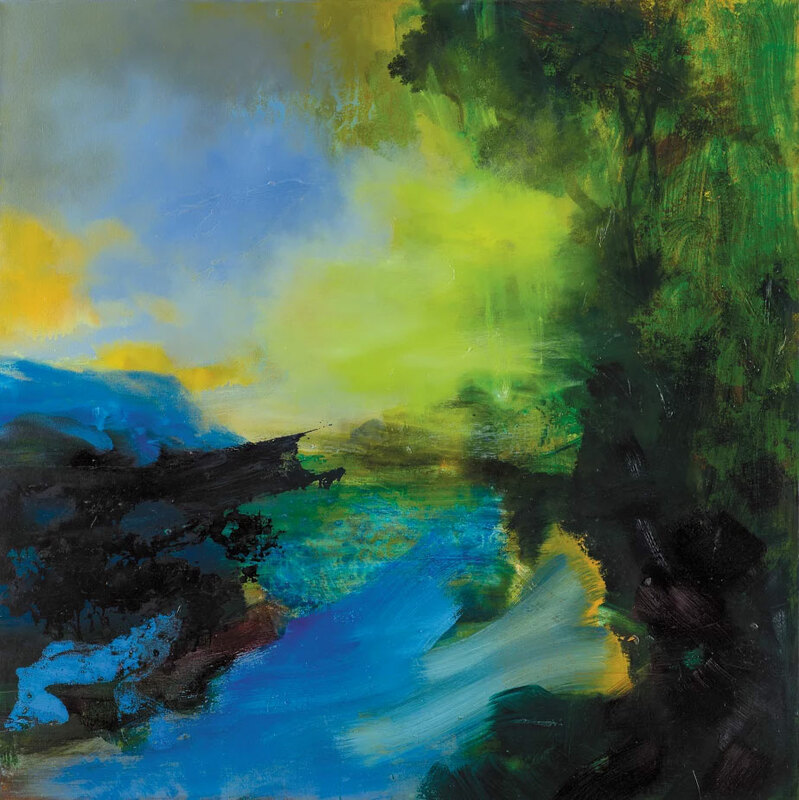 In 1998 Rankle said in conversation with writer and scholar, Anthony Wallersteiner, “My paintings represent re-workings of a single theme: that of a sudden encounter with a dark edge of water – a pond or river – on the outskirts of the city. A place reeking of desolation and the potential energy of decay, the meeting of urban and rural landscape.” Now in the 21st Century that dark edge seems to loom somewhere between our whole planet and the abyss. As with much of Rankle’s work this evolving series has a multi-layered aspect. The 2007 title ‘Formal Concerns’ for example refers to the way abstract artists of the 1970s, when Rankle was a student, would distance their work from an involvement with so called ordinary life and political issues by using the term to describe their aims. It refers also to the belated pronouncement by the British Government’s Chief Scientist who recently expressed “Formal Concerns” on the subject of global warming. To mark his place in the contemporary canon, Rankle could be described as a landscape conceptualist, influenced as he is by idiosyncratic and purposefully provocative artists of an earlier generation such as Antoni Tapies, Joseph Beuys and Anselm Kiefer. You may ask yourself what do the fine art antics of these luminaries have to do with Rankle’s classical landscapes? You will not see Rankle lugging an old mattress out of a skip to create a sculpture like Tapies. You will not see him sitting in a gallery window smearing his head with honey like Beuys. You will not see him piling up the surfaces of his canvases with dead flowers and broken glass like Keifer. Rankle’s conceptual and neo-expressionist influences are deeper and more subtle than all that, but they are, none the less, marked in many ways by the work of these artists. Like these avant garde provocateurs his work unarguably strives to reflect the world by distorting it radically for emotional effect, to excite the emotions, change the status quo and ask questions, which only suggest more questions. Tapies worked to undermine traditional fine art with his use of unconventional objects, for instance for his Matter Painting he mixed marble dust and clay and incorporated found objects such as straw, string, paper and cloth. Rankle’s work is often not so far from this approach with his method of adding textures and materials such as sand, plaster, collaged found objects and gold. Like Tapies he channels his concern for the social and political role of the artist. Tapies took the use of found objects to a new level in the early 1970s with the use of buckets and furniture in his work. Beuys fuelled passionate and often acrimonious public debate, and like Rankle was a master of publicity. In 1940, as a volunteer for the Luftwaffe he may have been, or probably wasn’t, wrapped in oil and felt after his plane crashed at the Crimean Front, but these visceral materials came to symbolize healing and survival, often seen in his provocative and magnetic work. 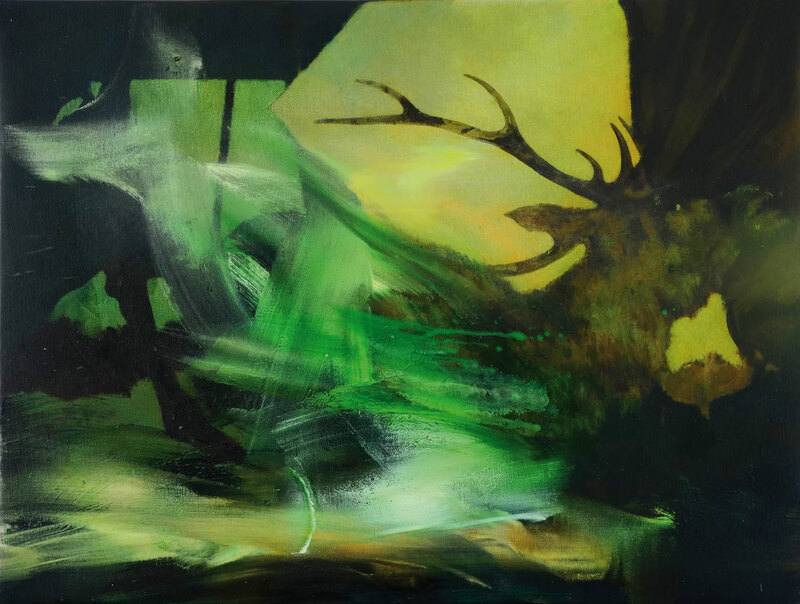 In the same way the viewer is drawn into the mystic concept of a Beuys work, that same viewer is pulled into a Rankle landscape with its dark and edgy pools, stricken stags and infinite vanishing points. Keifer studied under and was inevitably influenced by Joseph Beuys in Dusseldorf and Keifer’s subject, according to art historian Robert Hughes, ‘is the fatal collision of German and Jewish history… Keifer’s talent is for the motif, the image.’ Like Keifer, Rankle takes issue with the past, although Rankle’s history may be less loaded than Keifer’s, but the motif and the image carry his messages. 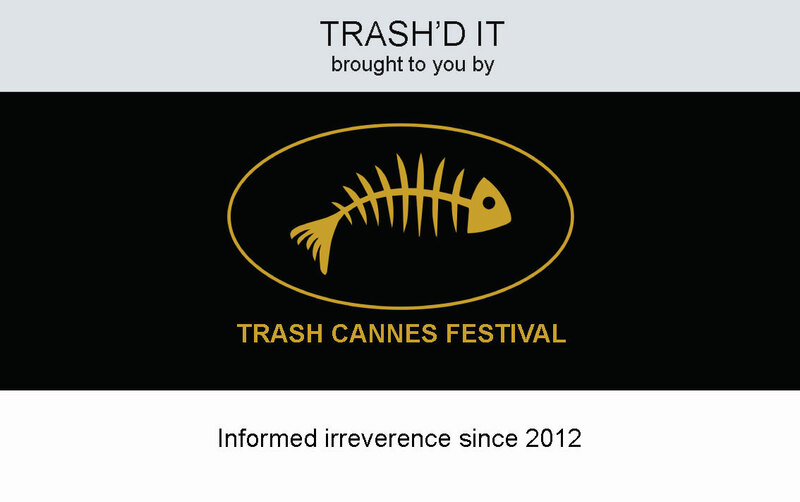 Like these material magpies, Rankle seizes fragments of a different kind from many places, not least art galleries, repositories of our collective memory. He shares Keifer’s concern with recent history, but goes further back in time. Rankle explains his own magpie methodology through the technique of ‘pentimenti’. ‘The virtuosity which became possible in oil painting with the beginning of the Venetian school, around the time of Titian, developed through many artists who inspired me, where the modern use of oil painting methods, wet into wet, glazing and scumbling allows a free spontaneously evolving way of creating the work. ‘Related to these historical techniques I decided to explore other ideas about the nature of painting. The illusions of ‘pentimenti’, which I used on layered paintings, are coming from observations on the way some Renaissance and Baroque paintings become more transparent with age to reveal the under-painting, and also any changes and alterations the artist made on the surface of the canvas. ‘The painting may be read as an evolving presence – significantly sometimes a figure previously painted out emerges from the shadows years later; often a portrait can be discerned to have several expressions. Rankle’s landscapes may be created in the 21st Century, but their message is as clear as John Berger’s interpretation of Thomas Gainsborough’s ‘Mr and Mrs Andrews’ which was painted in 1750. True to his socialist roots, Rankle seizes left wing opinion on Thomas Gainsborough’s ‘Mr and Mrs Andrews’ commissioned by the couple. Mike Gonzalez in Socialist Review, December 2007, saw them as “complacent bourgeois farmers” with “safe landscapes neatly trimmed and fenced off behind”. As the art critic John Berger noted in his 1972 Booker Prize winning book, ‘Ways of Seeing’, Mr and Mrs Andrews are painted as “landowners and their proprietary attitude towards what surrounds them is visible in their stance and their expressions”. To be fair to Gainsborough these “complacent bourgeois” are indeed painted as complacent and bourgeois — and Gainsborough in this sense proves himself as an accomplished realist artist. This was the great age of the landscape gardener, designing manicured bucolic vistas. But the stance and body language of the Andrews could not be clearer, particularly that of Mr Andrews. He seems to say, ‘This is my land. This is my wife. This is my gun. This is my dog. This is my legacy.’ Note the unfinished area on Mrs Andrews’ lap which, it must be assumed, would eventually be filled in with an heir to the Andrews fortune. But overshadowing this patronage of the arts was the trade in slavery and environmental pollution. This entry was posted on 24 November, 2016 in homepage and tagged Alan Rankle, Anthony Wallersteiner, Judy Parkinson, Keith Rodway. Bookmark the permalink.